The Waitakere Ranges. 30 minutes from the centre of town, chock full of great running trails, and most Aucklander’s never go there. We are very spoiled. Since 2007 when I ran my first ½ marathon after a 30 year rest period. 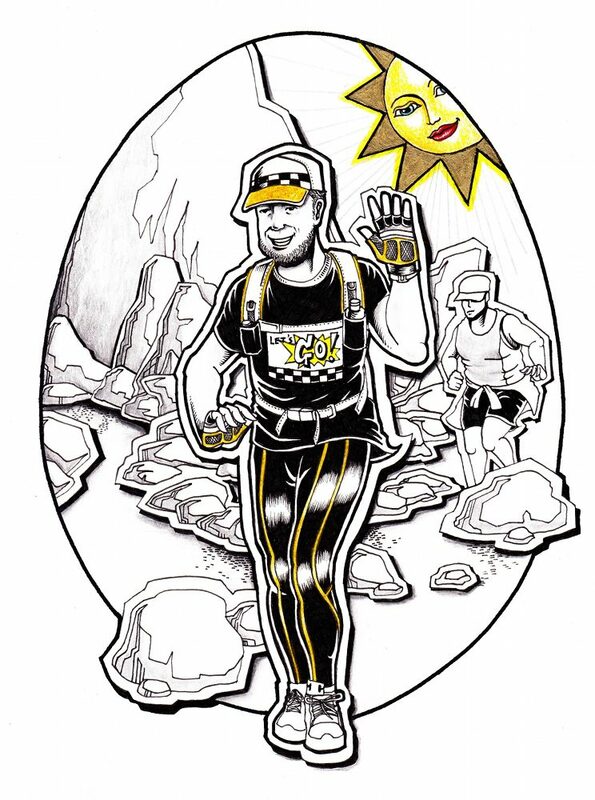 “Ran” my first Routeburn the following year and have done it every year since (except for 2011when I was broken). Except for the odd broken bone (tripping is always a hazard for me) trails damage me way less than road running. Plus trail running gets me places I would never think of going otherwise. Its true – I have seen more of my own country since taking up the sport than in the entirety of the rest of my longish life. And trail runners are very cool people! Much less that I probably should. Every year I say I will train harder for next time but then don’t. In essence though I do one long bush run a week, increasing the time-on-feet progressively as race day approaches. I also try and get at least a couple of ½ marathon distance off-road races in over summer. Otherwise I only run two other days a week – hill repeats one day (doubles as high-intensity training) and a tempo road run on the other (again slowly increasing the distance). It’s not conventional I know for endurance distance runners, but over the years I have found, as an older runner, that running more than 3 days a week breaks me. For the other days in a week, I cross train on a stationary bike or walk off-road for one day (or rest if feeling tired or have niggles), strength train on two days using weights (one of these with my brilliant PT) and on the final day have complete rest doing absolutely nothing. In reading this, do however remember that I am a tail-ender. About as far removed from the elite who win it as you can get, short of not being a runner at all. And as a tail-ender I do sometimes wonder what it would be like to be able to run like those who do it in half the time that I do. And know what their running background is and how much training they do. I would certainly like to see a movie of them in motion so I can try to work out how they run over stuff that I pick my way through. That said, while I am sometimes in awe of what they do, I do not envy. Just curious. Firstly, make hills your friend. The more training you do on hills, the happier you will be at the end. And practice running downhill. Sounds odd I know but myself and many of my trail running friends find running uphill far easier on the body than going down. Secondly, of you are not already a trail runner, get off the roads. Find a group of like-minded people to run with and hit those trails. It doesn’t matter how good a road runner you are, when you go bush you will discover numerous muscles that you never knew you had. All those lovely little stabilisers that need strengthening, as well as your core. Thirdly, find someone who does really good deep tissue massage (who preferably is also a runner) and get one as often as you can afford it (or alternatively if money is tight invest in a roller and get on it). Fourthly, buy a decent pair of free draining trail shoes also suitable for harder rockier surfaces. You will not regret it. And lastly, most of the people I have talked to who have done the race say that at some point they cramp on it. Even those who are really fit and not usually prone to muscle cramps. Something about the amount of uphill, maybe the altitude, who knows. Forewarned is forearmed. I carry StopCramp oral spray, magnesium & electrolyte pills, and salt. If one doesn’t work, another might. Oh and take a camera. The views will blow you away. Nope. Other than as mentioned previously re running training. Not enough time. Well as I am not actually a performance runner, and haven’t really made a science of it, I don’t really know. I am basically just happy to finish – preferably in one piece. I put electrolytes in my water pack and try to remember to take in a gel or some other carb every hour of the race, but only because that is what I have read one should do on distance runs longer than an hour. I have plenty of body fat so am not likely to starve to death over the duration of the race, even over the time it takes me to do it. Perhaps the biggest thing for me is the amount of time spent without consuming coffee. So I make sure my gels contain caffeine and even buy coffee flavoured ones if I can. I taper for a week before the race itself, two weeks if I have niggles, and use the excuse of carbo loading to eat too much pasta for a couple of days before race day. Otherwise, nothing special. Where do I start? Some people think I am nuts having run it five times and am planning to do another. But there really is something special about this one. I am a late starter in running but since 2007 have done (slowly) dozens of ½ marathons, quite a few 33k distance races other than the Routeburn Classic, and four marathons; about 50:50 road and off-road, and in countries other than New Zealand. Some I hated. Most I never repeat. So what keeps me coming back to this one? I think the mountains are a big part of it for me. Not the ‘conquering’ nonsense. But the simple magic of being in such an awesomely beautiful place. Plus every time I run it, things are different. The weather alone is never the same – I have done it in snow, rain, glorious sunshine, baking hot. Every year is different. Plus it’s not really a single race in my mind but one with quite distinct parts to it, each with its own character. The beech forest, the lakes, the mountains themselves, the redwood forest, the river plain – I just never get bored with it. Even if it never gets any easier! The race is tough but well worth the effort. If I can do it, anyone with good base fitness can. Don’t be afraid to walk if you need to and take the time to look around and appreciate where you are. At the end, enjoy the moment, partake of the hospitality, and be proud of your achievement. You will have done something that only a comparatively lucky few have done before.